Whether you voted for him or not, one thing every American, or anyone living in the US can all stand behind is that we all want the country to improve and prosper. That's why we all stand behind Barack Obama and wish him - and the USA - all the best in the next four years. 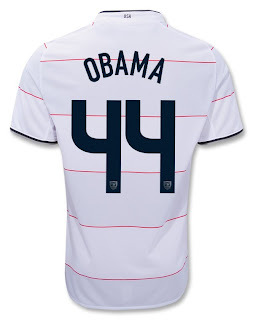 That's why we made this special jersey to commemorate President Obama's historic inauguration in the best way we know how, by adding him to the squad of the USA National Soccer Team. There's no better way to show your support for your country and your government than by wearing this amazing jersey, with authentic USA letters and numbers, to the next big USA match or to the White House!